Peru, Bolivia and Ecuador have all become democracies. Farming, weaving, pottery and pyramids have all appeared in this region by this date. On the Pacific coast maize has become the staple crop. The Chavin civilization has appeared. 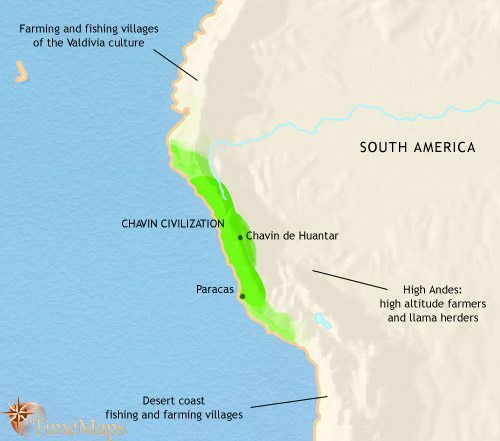 Chavin civilization seems to be in decline. The Chavin civilization has given way to numerous local cultures. The Moche civilization is now flourishing. The warlike Moche civilization continues to flourish. 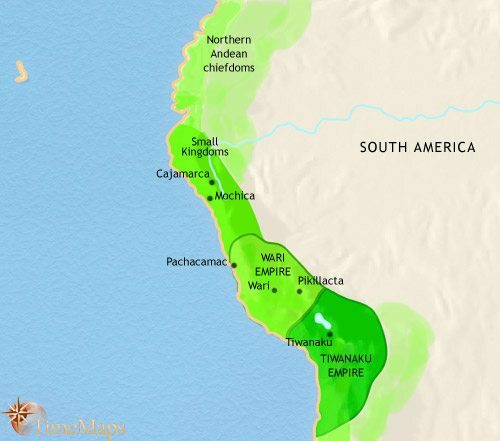 The Tiwanaku and Wari empires now dominate Peru. The Chimor empire has now emerged. The Wari and Tiwanaku empires have collapsed. The Chimor empire is at the height of its powers, but the Inca empire will soon challenge it. 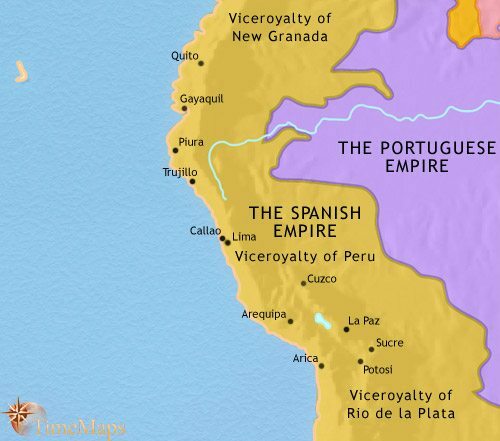 Peru now lies at the heart of the vast Spanish empire in South America. Peru has experienced administrative and economic decline. 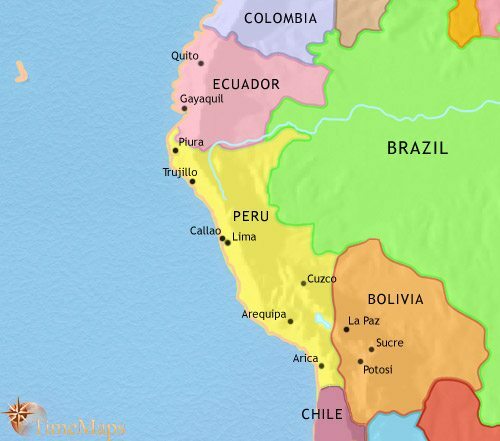 Peru, Ecuador and Bolivia have fallen under the control of caudillos. Peru, Bolivia and Ecuador have been ruled by numerous caudillos. Peru and Bolivia have been defeated in the War of the Pacific. Peru, Bolivia and Ecuador have all experienced intense political instability. In Peru, the military governments were unable to deal effectively with the grave social inequalities in the country, and this failure fuelled growing terrorist movements, notably the Shining Path. A return to democracy in 1980, and the vigorous presidency of Alberto Fujimori (1990-2000), brought, first, victory over the terrorists and, then, economic progress. Fujimori’s growing authoritarianism caused his fall from power, since when the government has returned to a more democratic stance. Bolivia saw short-lived military governments, hyperinflation and a growing reliance upon cocaine exports to bolster the economy. Finally in 1985, an elected civilian government introduced stern economic retrenchment, which led to political stability, economic recovery and success against the drugs trade. Ecuador’s economic downturn in the 1950’s and 1960’s led to the rise of terrorist movements until, in 1984, the country returned to democracy. Since then the country has been run along democratic lines. The Pacific coast is a dry region, punctuated by streams and rivers which bring water down from the Andes in spring and early summer, often in raging floods, but are dry for the rest of the year. The offshore currents are some of the richest seas in the world for nutrients. 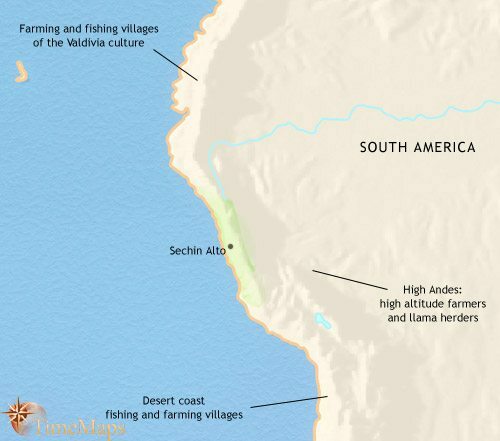 Settled villages of marine hunter-gatherers have grown up here at least since 8000 BCE, with farming beginning in the 6th millennium BCE. Since then it has gradually become more important, and populations of farmers have grown up in the river valleys on the Pacific coast, to exploit the streams and the fertile mud deposited during the seasonal flooding. Irrigation systems have developed, and around 2000 BCE large communities with populations running into thousands emerged; large pyramids, of design and construction which would become familiar to later phases of Andean civilization, are already being constructed. Pottery and loom weaving are practiced. A short distance inland, where the land rises sharply to the High Andes mountains, a shift from hunting to herding llamas is taking place, and an agriculture based on a small set of high-altitude plants, mainly potato, oca and quinoa, has appeared. Populations are expanding rapidly, and trade links between the peoples of the coast and the highlands are developing. On the Pacific coast, maize has become the staple crop, leading to increases in agricultural productivity and further expansions of populations. Numerous monuments have been constructed at ceremonial centres, and many of the elements of later Peruvian architecture are already prominent – flat topped pyramids, sunken courts and ceremonial complexes laid out in a U-shape. In the Andes highlands, herding and agriculture are continuing to displace more ancient hunter-gatherer lifestyles, leading to continued population growth. The trade links between the highland and coast continue to expand, to the great mutual benefit of both groups. They bring more food up to the highland populations and useful leather goods and other products down to the coast. These links are seeing the evolution of a unified cultural area embracing the two radically different environmental zones. The past few centuries have seen the cultural – and probably political – centre of gravity shift inland from the coast, with the spread of the Chavin culture over a large part of the region, both in the highlands and coasts. The Chavin represents a step change in South American culture, with the building of substantial stone temple complexes and the production of fine textiles and pottery. 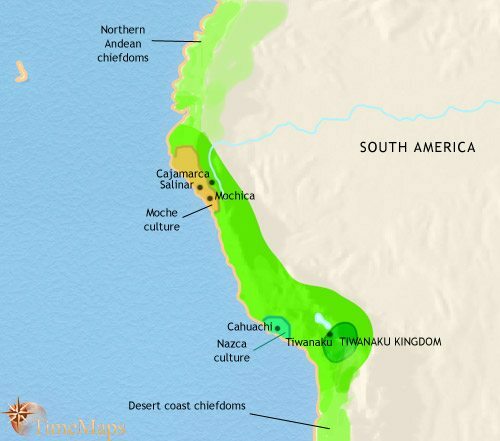 Many archaeologists regard it as the earliest phase of true Andean civilization. The culture seems to be linked to a particular religious ideology, expressed in a set of artistic motifs which appear on the pottery and textiles throughout the region, replacing numerous more local styles. In the High Andes, irrigation has been introduced around the high altitude lakes of the region, including Lake Titicaca, supporting further population growth. The past few centuries have seen major technological advances take place within the Chavin cultural area. Cloth production has been revolutionized with the development of tapestries, along with other innovations in weaving. Metalwork has seen the introduction of new techniques such as soldering, welding, and the alloying of gold and silver, allowing new styles of artwork to be created. By this date, however, there are signs of stress within the Chavin cultural area, probably caused by prolonged drought. Major Chavin centres are being abandoned, and monumental building activity is generally on the decline. There are also tell-tale signs of a rise in inter-communal violence, especially the appearance of fortified villages. Various localized cultures have now replaced the more unified culture of the Chavin period. The most notable of these are to be found along the coast. The people of the Nazca culture are particularly famous for creating the “Nazca Lines” – vast figures traced in the desert, depicting animals and geometric shapes, whose purpose is unknown. However, more prosaically, they continue the Chavin tradition of fine textiles and pottery, producing a lively style of their own; and whereas the bulk of the population live in small farming communities, their central ceremonial centre at Cahuachi is a complex of pyramids and plazas covering a large area. Northwards along the coast a large town has developed at Gallinazo, the centre of an economic base consisting of the largest and most elaborate irrigation system yet seen in South America. 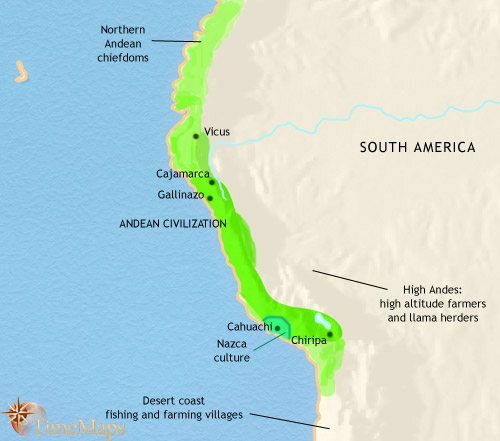 The Nazca culture continues to flourish, and by this time another coastal civilization, the Moche, is producing impressive urban and religious centres. Major irrigation schemes, inherited from the Gallinazo culture, enable Moche farmers to grow maize and other crops in the desert, and allow a lively and sophisticated culture to flourish. Moche craftsmen produce some of finest pottery and gold work in pre-Columbian America, and Moche art is striking for its realism. Architecturally, the Pyramid of the Sun at Mochica, made of adobe, is a truly impressive structure. 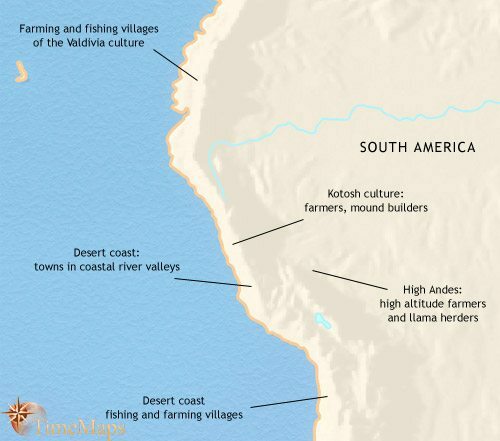 The Moche and Nazca cultures continue to flourish along the Peruvian coast. The long-lasting growth in warfare amongst the peoples of this region, noticeable since the last days of the Chavin culture, finds vivid expression in Moche art, where lively scenes depict combat between warriors. These are echoed in the rich warrior graves of the period. The Moche glorified warfare, and their religion practised ritual combat, and along with it, human sacrifice. 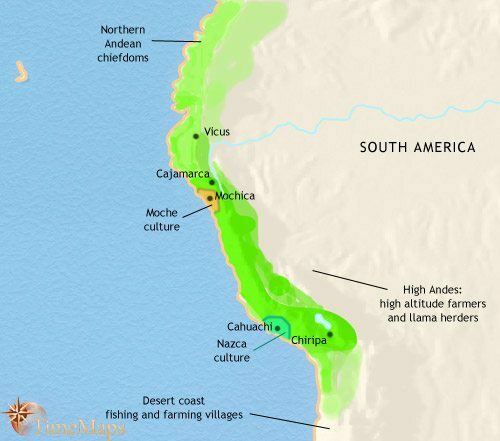 The Moche and Nazca cultures of the coast have vanished. Instead, two highland empires now dominate much of the central and southern Andes and parts of coast. These empires – the Tiwanaku and Wari – share a similar art style, traceable back to Chavin culture, and perhaps therefore a common religion. Tiwanaku, centred on a populous city on the bleak highland plains of Lake Titicaca, seems to have been a focus for religious pilgrimage from peoples throughout the Andes. Wari, on the other hand, seems to have been a more militaristic society. Both empires administered their outlying territories from provincial centres, from which vast public works were organized, and carried out as labour tax by the local inhabitants. These cultures laid down many of the administrative features which would later be used and developed by the vast Inca empire. 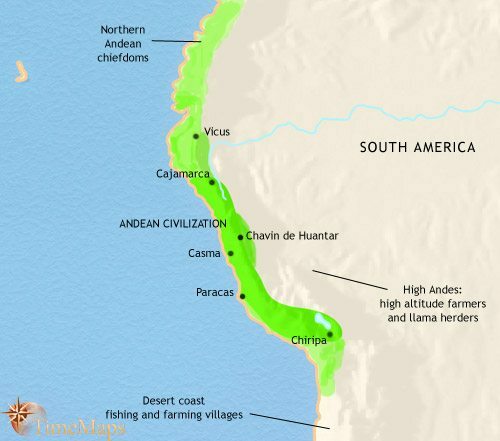 In the Andes region, the Wari and Tiwanaku empires continue to flourish, but two coastal powers have also emerged: the kingdoms of Chimor, centred on the impressive city of Chan-Chan, and of Lambayeque, with its capital at Batan Grande. Chimor seems to unite elements from both the coastal and the highland traditions of Andean civilization. Like the empires of Wari and Tiwanaku, based in the high Andes, it is a centralized state, dominating subject areas through state fortresses and military colonies. Like earlier coastal cultures, on the other hand, its economy is based on large-scale irrigation agriculture in the fertile valleys of the Pacific coast. Taking over the canals and dykes built in previous centuries, the Chimor enlarge and develop them into the largest irrigation systems of Pre-Columbian South America. Lambayeque, to the north along the coast, is the largest and most powerful of Chimor’s neighbours. It is apparently less centralized than Chimor, functioning more as a confederacy of cities than as a unified state. It too has a large canal-based irrigation system, and is centred on a large city. In the highlands of the Andes region, the Wari and Tiwanaku empires have now broken up into numerous small states. One of these is the Inca kingdom, who by this date control a few valleys around their capital, Cuzco. On the coast, the Chimor empire now dominates a large territory, and is still expanding. Like the Wari and Tiwanaku before it, it is a strict hierarchically organized state. Along the coast to the north, Lambayeque seems to have suffered a major climatic disaster – devastating rains followed by a severe famine – which may have been linked to the exceptionally severe El Nino of 1100. In the aftermath, the political capital was moved to Tucume Viejo, probably signifying a change of regime. 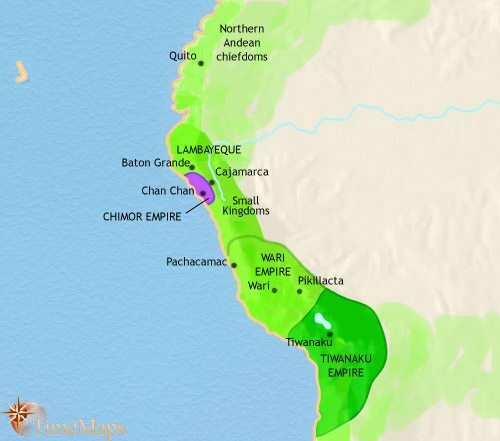 By this date, Chimor has conquered Lambayeque, probably in about 1370, and now dominates a large part of coastal Peru and Ecuador. The Chimor government operates a well-tested imperial policy by which new colonies are planted in conquered areas. From them, local populations are massed for road-building, irrigation and drainage schemes. The capital, Chan-Chan, has become one of the most sophisticated cultural centres in Pre-Columbian America. 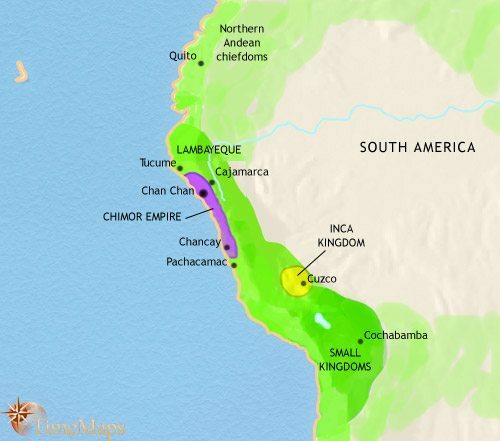 The Inca kingdom in the High Andes is now expanding fast. It has only recently become a truly centralized state (c.1438), and has been occupied overcoming determined resistance from neighbouring Andean groups. Those peoples which do submit peacefully to the Incas are brought into close alliance with the ruling power by being granted the status of “honorary Incas”; those that resist are uprooted from their homelands and relocated elsewhere, the vacant territories receiving loyal colonists. By this date the Incas control the Lake Titicaca region, the “breadbasket” of the High Andes. This has given them the economic launch-pad for further expansion. 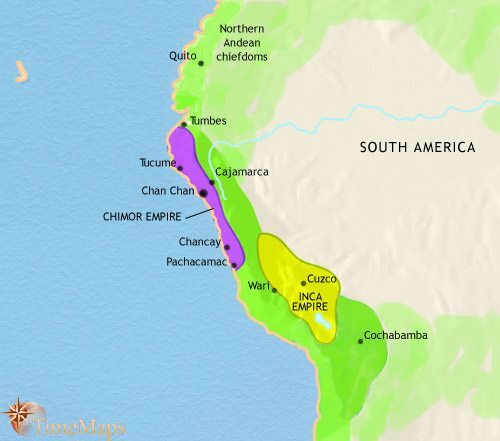 The Inca conquered the Chimu empire in the 1470’s, and took over their imperial systems wholesale. New conquests continued to be added until they ruled an enormous empire in western South America. This great state came crashing down after the arrival of a small Spanish force under Francisco Pizzaro in 1532. Dissident Indians, spectacular Spanish ruthlessness and, most importantly, European diseases, which wiped out millions of Indians, greatly assisted Pizzaro and his men, and soon only small pockets of resistance remained. The Spanish crown soon imposes its authority directly on the colony, through its own officials sent from Spain. 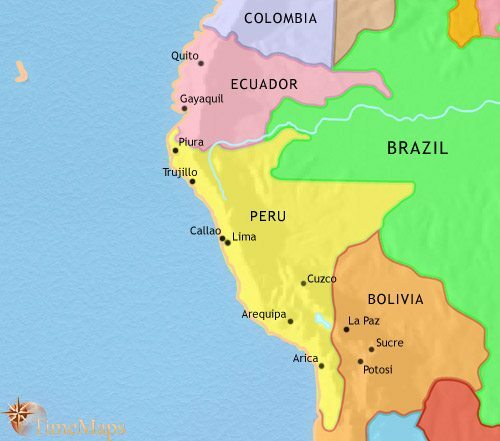 Peru becomes the centre of Spain’s growing South American empire. At this time thousands of Spaniards are pouring into Peru, eager to have a share in this brave (and, hopefully, fabulously wealthy) new world. Silver mining is the key economic activity, making Peru and Bolivia the most valuable parts of Spanish empire. The capital, Lima, is the greatest city in the Americas, home of the viceregal court and centre of Spanish society and culture in the New World. With its port, Callao, it is the focal point of international trade in Spanish South America – by law all overseas trade of Spanish South America has to pass through Lima and Callao. This region has seen a decline in its administrative and economic status over the past few years. The establishment of new viceroyalties to the north and east means that Lima is no longer the most important centre of Spanish government in South America, and the loss of the huge Potosi silver mines of Upper Peru (modern-day Bolivia) to the newly-created viceroyalty de la Plata, centred on Buenos Aires, has been a particular blow. Moreover, the economic reforms of the Spanish government mean that no longer does all the trade of Spanish South America have to pass through Lima. Nevertheless, this decline should not be exaggerated; the economy has benefited from a general upswing in Spanish South America’s prosperity brought about by the economic reforms. Moreover, this region continues as a wealthy centre of silver mining, even though this is now in long-term decline. Trade liberalisation has seen the rise of Guyaquil as a flourishing port. Much of the Indian population remains as forced labour for the mines, and the majority of the rest work as serfs on the large estates. A major revolt in 1780-3, led by a descendant of the Inca kings, caused considerable disruption. 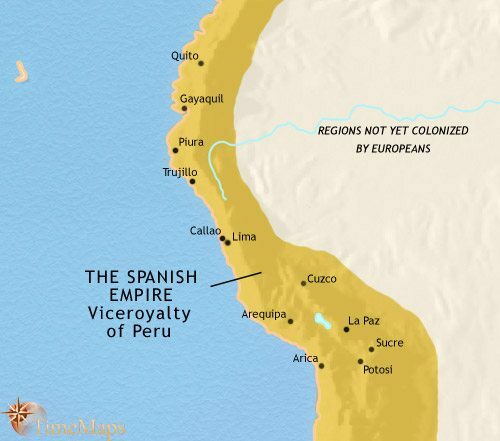 Peru remained loyal to Spain throughout the wars of liberation, due to the conservative attitude of the Peruvian landowners as well as the presence there of the bulk of the Spanish South American army. Upper Peru, on the other hand, was amongst the first regions to rebel against Spain, in 1809. Here, the war of liberation took the form of a prolonged guerilla movement. Whereas Peru’s “liberation” was achieved after two major defeats of the Spanish army in 1824, Upper Peru was only finally liberated in 1825. Almost immediately her leaders declared their independence from the liberation leadership in Buenos Aires, and named their new country Bolivia (in honour of the great liberator, Simon Bolivar). Ecuador started the independence period as a part of the Republic of Grand Colombia Federation, but became a country in its own right when that federation broke up in 1830. As with most of the rest of South America, Peru, Ecuador and Bolivia fell under the control of military strongmen, known as “caudillos”. 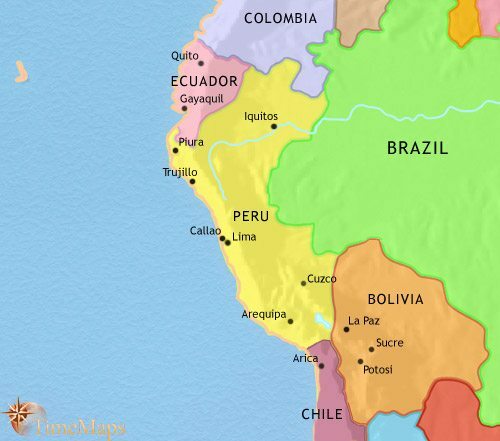 Peru, Bolivia and Ecuador have been ruled by numerous caudillos, or military strongmen. In Peru, general Ramon Castilla finally imposed political stability and economic progress between 1845 and 1862. Since his time, however, political instability has returned. In Bolivia, none of the caudillos have been able to solve the problem of economic stagnation and chronic poverty amongst the majority of the population. In Ecuador, years of civil war and military dictatorships have seen power alternating between the conservative landowning ruling class, based in Quito, and the liberal mercantile classes of the coast, based in the port of Guayaquil. This period of chaos culminated in the autocratic rule of Garcia Moreno (1860-75), who has tried to use the Catholic Church to unite the country. Along the Pacific coast of Peru and Bolivia, a highly profitable nitrate industry has grown up. This is controlled by foreign corporations – Chilean, British, North Americans. In the highlands, too, the traditional silver mining industry is now being revived by foreign (mainly Chilean and British) investments. A nitrate mining boom exacerbated border disputes, leading to the War of the Pacific, between Chile on the one hand, and Peru and Bolivia on the other (1879-83). Chile won the war and extended her territories, depriving Bolivia of any coastal territory, a devastating blow to the country, and also eating into Peru’s coastal area. Both countries were left almost bankrupt, and this, plus the national humiliation of defeat, undermined the credibility of their military governments. Eventually this led to democratic regimes coming to power in both countries; these have presided over periods of political stability, foreign (mainly US) investment and economic recovery. In Ecuador, Moreno’s downfall (1875) saw Ecuadorian politics return to factional strife between the conservative landowners of the interior and the liberal capitalists of the coast. The latter have generally predominated, and under them, freedom of religion and the liberation of education from the Catholic Church’s control have been enacted. There has also been a major railroad and road building program. In Peru, a long period of stable constitutional rule saw the rise of a movement known as the Apristas, which championed the rights of the Indian majority, and of a right-wing, neo-Fascist movement, supported by powerful elements of the old ruling classes, which bitterly opposed them. In 1930, a military coup in the wake of the Wall Street Crash ended the years of civilian government, and instability, accompanied by full-scale political persecution, has been the rule since. In Bolivia, a strong post-World War 1 recovery in the 1920’s gave way to economic decline in the 1930’s, during the worldwide downturn. Defeat in the Chaco War with Paraguay (1932-5) led to political instability, with military rule alternating with civilian rule. This has culminated in the so-called Bolivian National Revolution of 1952 -64, which has resulted in a general improvement in the condition of majority Indian population. Ecuador has continued to experience chronic political instability, the result of extremes of wealth and poverty. This has undermined the country’s ability to defend her borders effectively, and she has lost a large slice of Amazon territory to her neighbour, Peru.